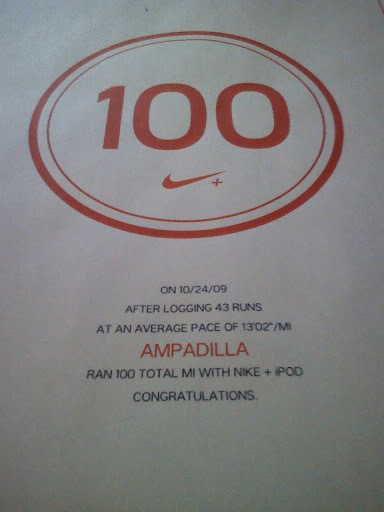 Nike was nice enough to give me the above certificate for (finally) going over 100 miles since I started using my Nike+ Sensor. It took 43 runs to get there, but I made it. Today was a 2.03 mile run (my 44th total). The park I run at is just beautiful right now. The trees (and there are many of them) are starting to change colors so it’s this beautiful symphony of green, red, orange, and yellow. Plus, running there around 5pm means the light comes beautifully through the trees when I run the back stretch and I wish I had my camera at the ready. Running and taking pictures at the same time could prove to be impossible. I really enjoy running there more than anywhere else. I realized that I didn’t really set my running parameters at the start of this blog. I do not intend to run every day (at least not yet, maybe one day!). I plan to go every other day, if possible. My poor legs need that day of rest. I am still alternating walking and running, though I hope that as my endurance increases, I can run the whole time. The most important thing though, is that I am not running for the purpose of losing weight. If I do, that’s a great side effect, but obsessively tracking minor weight fluctuations has been part of the reason this didn’t work before. The last time that I did this, I was also counting calories ( eating 1300 or less each day, per the recommendation of Livestrong.com for losing 1.5 lbs. a week) every day. When you are tracking your eating and exercising and not losing ANYTHING, it is very discouraging. Stephen told me that I needed to give it more time, but those who know me know I’m not a patient person at times. So, despite the fact that my Wii Fit so lovingly tells me that I’m overweight (Stephen and I did Wii Fit yesterday and my abs hate me today…jackknives are my friend and enemy in one), I’m going to do this to feel better. To feel healthier. To look healthier maybe, but not to get to a goal weight. Or a goal pant size. I think this is a much better way for me to do this. Nike Running has challenges that you can take part in to make the process more fun and have some friendly competition. I’m not too competitive, so I joined one today called Across America. It tracks your total distance and plots where you are based on the cross country run done by Paul Staso in 2006. It goes from Oregon to Delaware. 3,260 miles in all. So, at my point I have just crossed over from Oregon to Washington. It started at Elsie, Oregon and I crossed over just past Portland. Here’s the route: Run Across America. It took him only 18 weeks. It will most likely take me a few years, but it would be amazing to finish! If anyone has song suggestions for running, let me know! Wow, thanks for the encouragement, Paul!